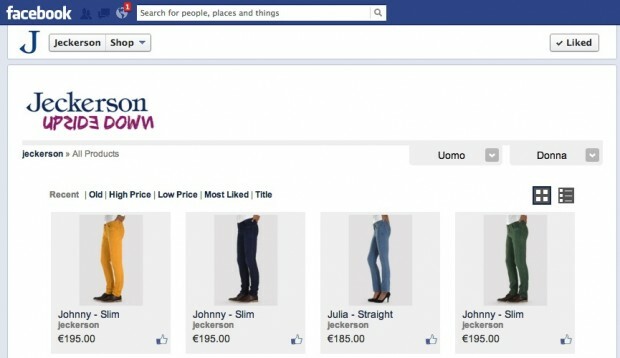 We’re happy to say that, following the agreement signed last July, Jeckerson, leading Italian fashion brand, has officially opened its Facebook Shop, powered by Blomming. The Jeckerson press release can be found here. To visit their Facebook Shop you can click here. It’s with great pleasure that we can now officially announce that Jeckerson, the fashion brand that became famous with their “patched” pants for golf courses, has chosen Blomming for their Facebook Shop, that will be online this fall. for the Facebook shop opening. Jeckerson, always engaged with new ways of communication, is moving towards the new highly dynamic Social environments. The brand, first mover in the Italian fashion industry, will offer to its customers a new and exciting F-Shop service, starting from next October. The distinctive feature of the Blomming Facebook Shop is to allow the buyer to complete the transaction without ever leaving the famous social network, unlike others services or apps already in the market. Blomming.com has been included in the Cool Vendor in E-Commerce 2012 report by Gartner, Inc., a leading research firm in the IT sector and, in Italy, has been awarded with the Premio Nazionale per L’Innovazione 2012.